I can’t say enough about the delectable food I sampled while I was in Chicago. I don’t think I ever had a poor meal, and some of the meals were incredibly memorable. A small cafe a few streets from the hotel yielded a huge spinach salad for my first day, enough to keep my energy up for over five hours at the Newberry Library. 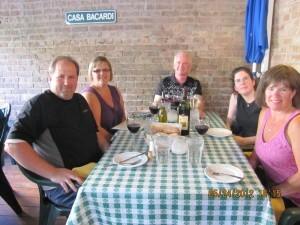 That night, my parents and I went with my aunt and uncle to Topo Gigio, an Italian restaurant in the Old Town. I had the fish special, and it was tender and delicious. We also visited a nearby spice merchant, and spotted the Bistrot Margot (more on this later). Our hotel was right next to Ditka’s, and I ate there once, having their New Zealand lamb chops appetizer. I also learned first hand that when you ask for a Jack Daniels on the rocks, it’s not like a Canadian bar where they give you 1 oz. I almost didn’t make it down the stairs from the lounge after two drinks! 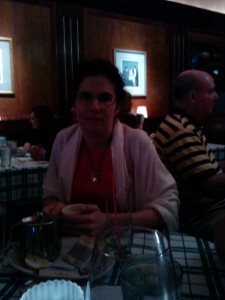 After dinner at Gibson’s… it was a little chilly in the restaurant, hence my pashmina and cup of tea. 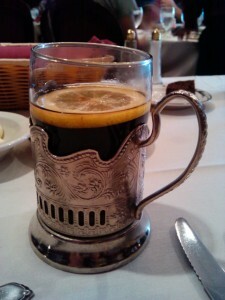 After our trip on the tall ship Windy, we went to Gibson’s steakhouse for dinner. If there were celebrities in attendance, I didn’t see any, but I was probably too busy looking at the gorgeous old 1920s decor… when I wasn’t trying to decide what to eat. Eventually I settled on some oysters to start, and the smallest steak they had on their menu. That’s one thing I can say about American restaurants — you get a lot of food for your money. And at Gibson’s, that means a lot of steak. Now, one of my favourite meals in Chicago was one of the most unexpected. That is, it was a completely chance occurrence, as we’d gone to visit the Art Institute (and stand in awe in front of Georges Seurat’s painting ‘Un dimanche après-midi à l’Île de la Grande Jatte’ — well, that part was perhaps just me) and after several hours of looking at art (more on that in another post, as I could go on about art for ages… you know me! ), we were starving. The best tea cup I’ve ever seen. 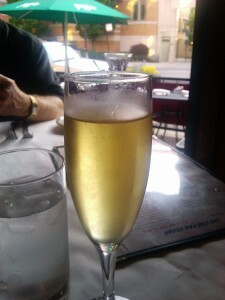 And finally, one of the most delicious meals I’ve ever had was at the Bistrot Margot on our last evening in Chicago. I wish I’d thought to take photos of the meal, but I was too busy eating… that’s my excuse. I had a vegetable risotto to start, and it came with a soft-shell crab. For my main meal I had a smoked duck breast with green lentils. And dessert was a delightfully delicious crème brûlée. I have a fondness for French food (as you might have guessed), and I was even happier at the Bistrot Margot when I saw that the menu had its dishes labeled if they were gluten-free. It made it a lot easier and I didn’t have to guess. Also, as it was our last evening, I decided to celebrate with a glass of champagne. 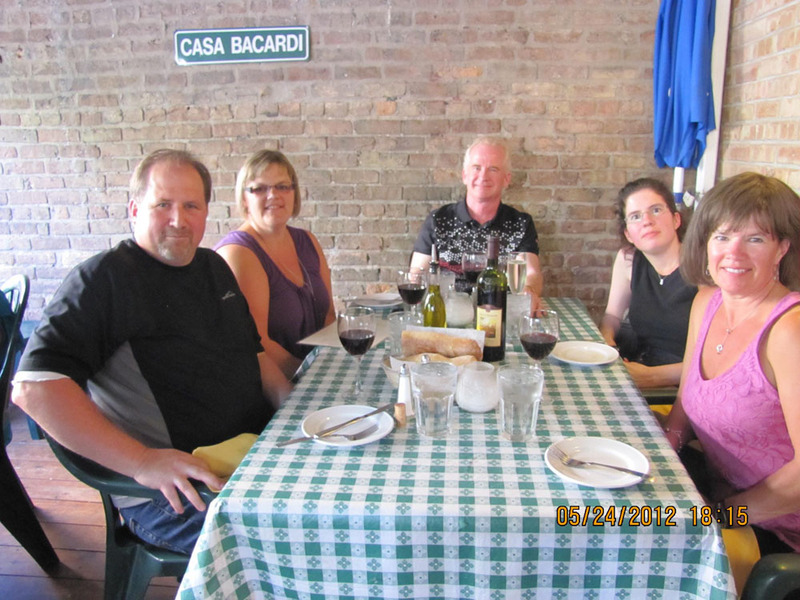 Now I’m starting to feel a bit homesick for Chicago… I know I’ll go back, and I’ll be well fed when I do! 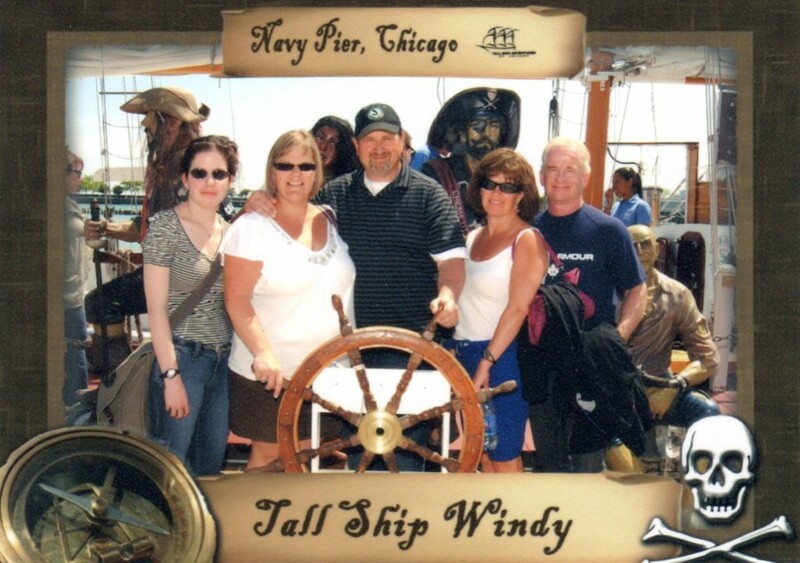 So shouted the docent aboard the tall ship Windy as we departed Chicago’s Navy Pier. He needed volunteers to raise the sails of the tall ship, and thus, with gumption (but no strength), I volunteered. For the record, though he said otherwise, strength is needed in order to raise a sail. Fortunately I had my father to assist me, or it would have been the slowest sail raising ever. I hadn’t done any sort of sailing since ninth grade, and I’d forgotten how much I enjoyed it: the wind in my hair, the rock of the ship, and looking out over the water. Of course, being on Lake Michigan, the view of Chicago’s skyline was rather spectacular. 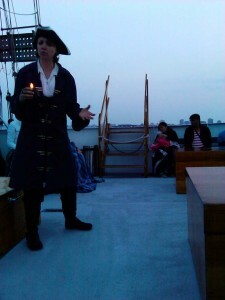 After the sails were raised, the program began on the main deck, and we learned about the life of a tall ship sailor. 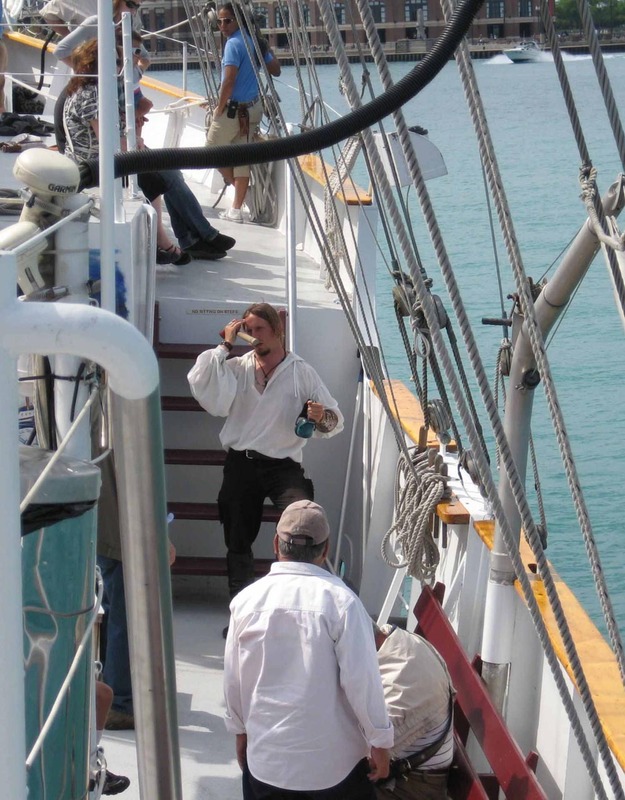 Unlike seafaring vessels, tall ships (and others) sailing the Great Lakes didn’t have to worry about food or water– the water of the lakes is fresh, and food was to be had from many ports. This closeness was good, but also difficult if you were a sailor not keen to follow orders. Like a small town, word would get around, and a truculent sailor could find themselves without work. Jessie tells of the woman immured in the lighthouse. As I like stories, and my family was attending the baseball game (yawn), I came back to the Windy for another excursion the next evening in order to hear some ghost stories. The docents (Zack & Jessie) were fantastic storytellers, with blood-chilling tales of a ghostly ship, a woman immured in a lighthouse, and several more. I’m not sure if it was just the tales that were blood-chilling, or if it was the weather–windy and overcast. I loved both trips, and I think that one of my favourite parts of the cruises was watching the docents interact with the kids on board. During the first cruise, a young boy was keen on listening, but was shy, and slowly began to move closer in to hear the tales. The docent noticed this and made a point of including him when he addressed passengers. And in the evening’s cruise, rather than give the usual warnings for kids to behave themselves, the docent shouted, “Children! Look after your parents! Make sure they don’t get into any trouble!” Also on that cruise, a boy and girl were very keen to hear ‘R-rated stories’ (or, as one crew member put it, ‘Arrrgh-rated?’), and they were able to pick from the chest of stories. 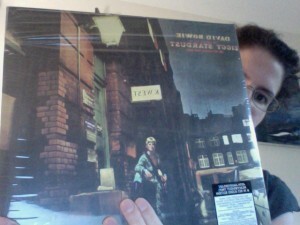 Delightedly, the boy picked the scariest one. 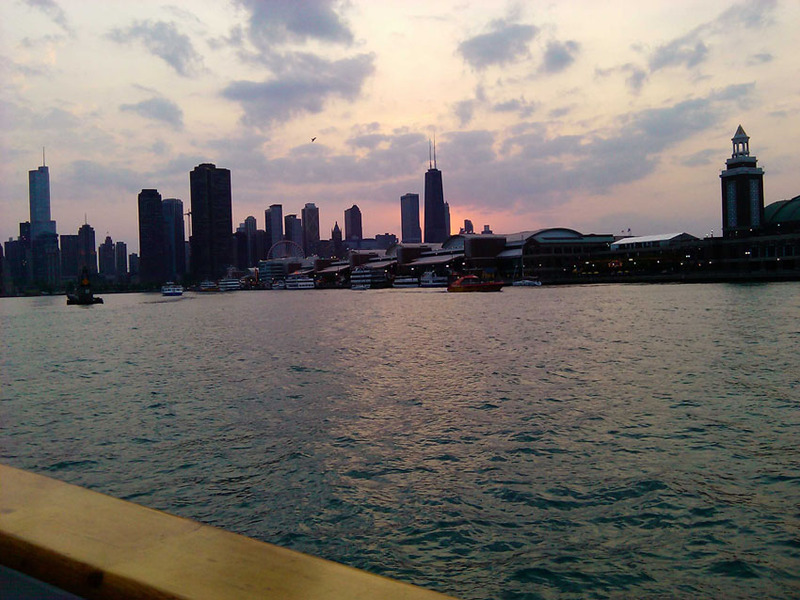 And fortunately, being aboard the ship as the sun was setting made for some gorgeous shots of the Chicago skyline. 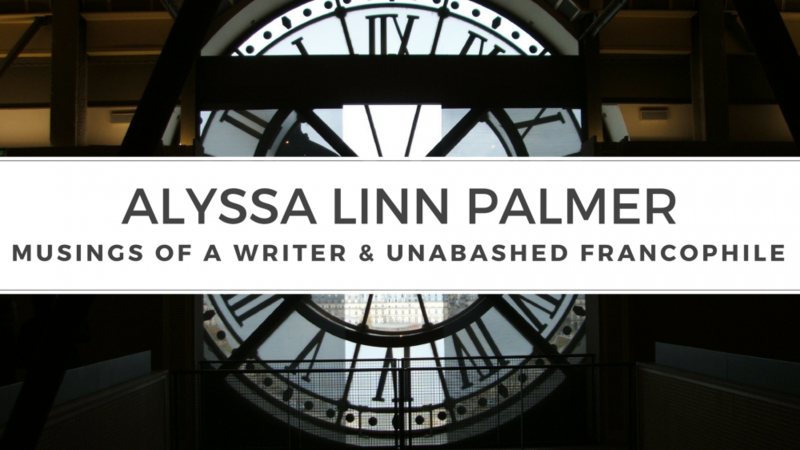 I’ve moved my site over from wordpress.com to its new home at alyssalinnpalmer.com. Hopefully everything will work properly, but for the next few days, please be patient if something isn’t loading properly!